A while ago I received a reader request for dampfnudeln. Dampfnudeln are yeasted dumplings filled with jam (often plum). (Dampf means “steam” and nudel means “noodle”.) They are also called Germknödel or Hefeklöße. (Both terms can be translated as “yeasted dumplings”.) I have to admit I am not an expert when it comes to recipes like this. Dampfnudeln are a Southern German or Austrian thing and I am from the North. It’s funny that I almost never get recipe requests for Northern German recipes. Since the requests usually come from Northern Americans who have German relatives or ancestors, it seems like nobody from Northern Germany ever emigrated to the USA or Canada. I know this isn’t true. So maybe our recipes are so crappy that nobody wants to preserve them. People where probably glad they left them behind. Anyway, I learned that there are several ways to prepare the yeasted dumplings. You can steam them or boil them in water. Or you can steam them in a milk, fat and sugar mixture. It seems that the water steamed/cooked dumplings are often called germknödel and the ones cooked in milk are called dampfnudeln. But I found a lot of conflicting information on this. The ones steamed and cooked in milk are supposed to have a sticky bottom once they are done. The ones steamed in water are more like enriched, light and fluffy bread rolls. For my next attempt I filled a large pot with water and placed a steamer basket inside. I steamed the dumplings for 20 minutes (without opening the lid!) and they came out perfectly. So this is definitely my favourite method to make dampfnudeln now. (If you want to try the other version, here is a description. As I said, traditionally these dumplings are often filled with plum jam or compote and they are served with vanilla sauce. My versions are not so traditional, but they are really tasty, too. 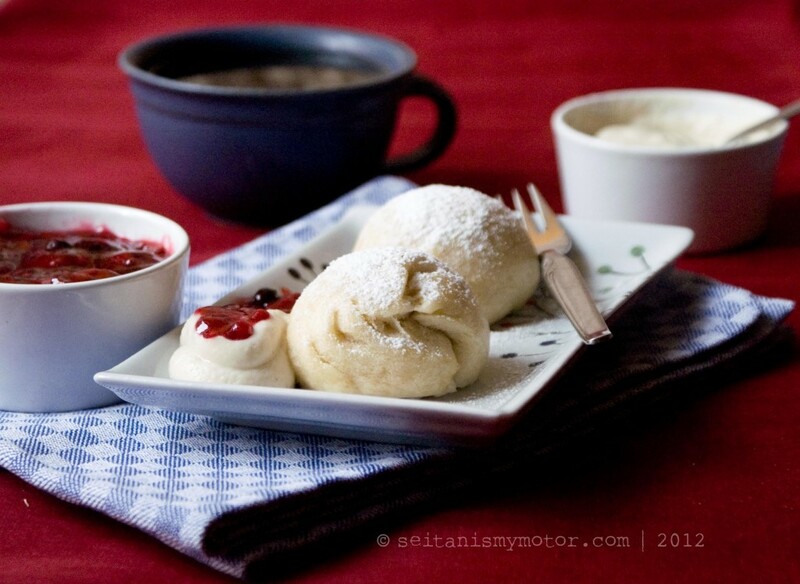 I filled the dumplings with with mixed nuts and served them with homemade almond cream and store bought rote grütze (red berry compote, my Northern German contribution to the recipe, here is my homemade version.) This was so delicious! The almond cream came out amazing and the slightly tart rote grütze was the perfect addition both to the sweet cream and the sweet dumplings. We ate way too much of this. Combine almonds and remaining ingredients for the almond cream in a blender. Blend until smooth. Set aside. Combine nuts and sugar in a food processor. Process into a fine meal. Add soy milk and pulse a couple of times until everything turns into a sticky mass. Set aside. Combine flour, instant yeast, sugar and salt in a bowl. Mix well. Add soy milk and oil. Knead with your hands for two or three minutes. If the dough is still sticky, don’t worry. Most of the gluten will develop during resting. Cover the dough with a damp kitchen towel and let rise in a warm place for about 60 minutes. Since the dough is quite enriched, it won’t rise that much. It definitely will not double. Knead the dough again for one minute. It should now have a silky texture and not stick to your hands or your working surface anymore. Place on a lightly floured working surface. Divide the dough into eight equally sized pieces. Roll them into a disk and place a heaping teaspoon of filling in the centre. Carefully close the dough around the filling and make sure it is properly sealed. You can roll the balls on your working surface once again to reshape them. Place them on a lightly floured surface and cover with a damp kitchen towel. Let rest for 20 minutes. (Again, they won’t rise much.) Place a steamer basket in a large pot, add water and bring to a boil. Place four of the dumplings in the basket, close the lid and reduce temperature to low. Steam the dumplings in the simmering water for 20 minutes. Remove and steam the remaining dumplings. Serve warm with almond cream and rote grütze, if you have. Steamed Dumplings! I’m definitely going to have to try these out, and maybe change up the filling a little. They look so cute and tasty! Sweet dumplings are still pretty foreign to me, since they really don’t exist around here. Apple dumplings, maybe, rarely, but yours here sound way more exciting. I’ve never heard of sweet steamed dumplings before, and they look incredible! Habe erst letzte Woche mitten im (Standard-)Rezept aufgegeben und anstatt Dampfnudeln einfach Buchteln gemacht: die Hefeklöße mit einer Zucker-Margarine-Mandelmilch-Mischung in einer Auflaufform in den Ofen, nach 15min mit Alufolie abdecken: gelingt immer! Bin für so etwas jetzt von Sojasauce auf Mandelmilch umgestiegen (trotz hohem Preis!) weils besser schmeckt und ned so sehr überkocht. Werde dank Deinem Rezept nochmal meinen ganzen Mut zusammen nehmen und mich nochmal an die Dampfnudeln wagen! I had no idea there were German steamed dumplings–I thought they were just a Chinese foodstuff. These look wonderful, Mihl. Thanks for showing us how to make them! I’ve never made dumplings of any sort, but dessert is always a good place to start in my book. They sound wonderful, and I can see myself eating the almond cream straight from the spoon! Thanks, Jodye! Well, we pretty much ate most of it straight from the spoon. I never knew the name of these as when I was in Germany my exchange oma would make them all the time and I just forgot to ask. These look yummy. I am used to the dumpfnudeln that you serve with potatoes gulosh (?spelling! )They are not sweet. They just consist of flour, salt, yeast and water. Then you spray the pan and add small amount of oil with water to steam. We here in USA have used a electric frying pan, and they always come out just nice. Soft on top and a nice crispy bottom, when the water has all evaporated and then the oil gives them a nice crust. I watched my grandma and mom make it and do not have a recipe, just go by feel!!!!!!!!!!! 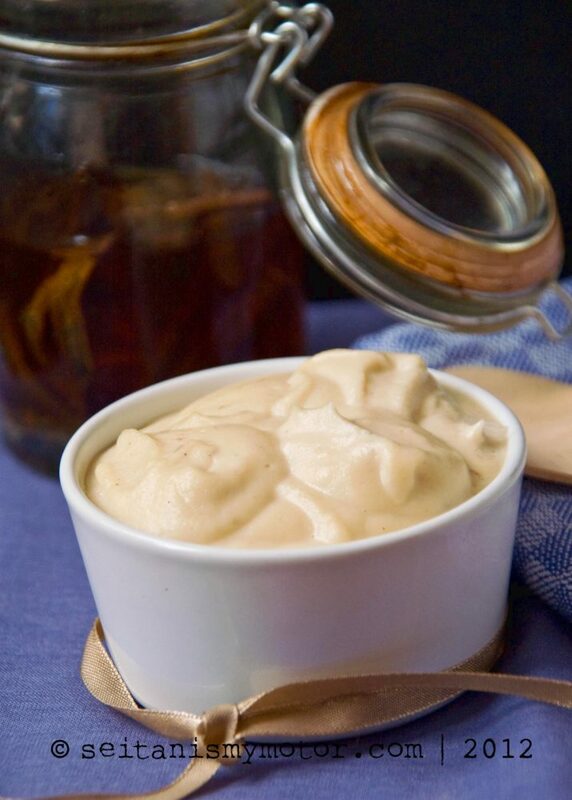 There was an someone that had told us about dampfnudeln that he had in Europe that was served with a vanilla sauce, When my mom made them, she made a vanilla sauce/pudding to go over them for him. We thought he would never stop eating!!! 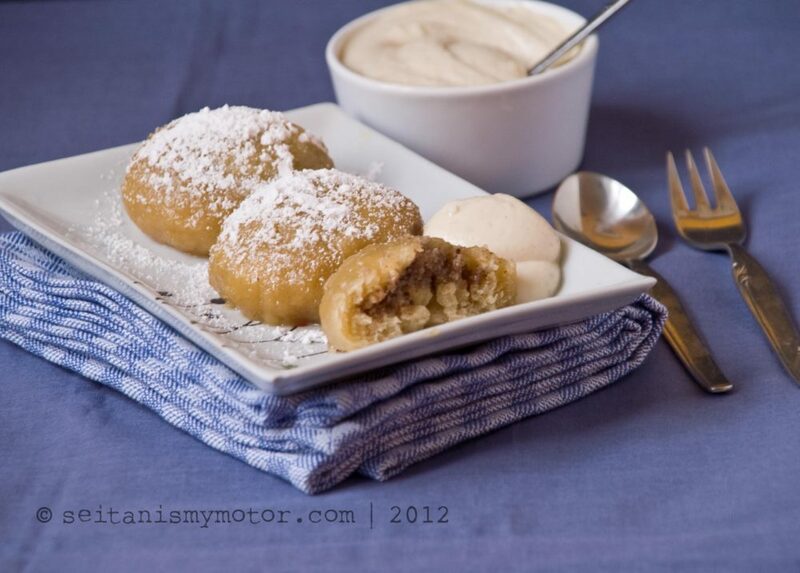 We have made plum dumplings with a potatoe dough, but never the dampfnudeln with a filling. I will have to try this. Thank you for your efforts. Please do not apologize for not being active on your blog. Your family and you comes first! Thanks for your nice comment, Gudrun! I think the savoury ones are usually called knoödel or klöße here. They are popular in the Czech republic, too! Very tasty stuff with goulash. And those electric frying pans sound awesome. It looks perfect! Was it a pain to clean the soy milk that boiled over? We have a mega old stove top here, so cleaning anything is a major bummer. And I’m such a klutz there’s always lots of cleaning to do in the kitchen. Send some of the cream my way so that I can drown my cleaning sorrows in it. Mega old oven here, too. I think I already kind of gave up on it and just dream about a new one. I’ve never heard of dampfnudeln before, but they sound amazing! (And I don’t think I know the difference between northern & southern German food–now I’m curious to figure it out.) Your dumplings turned out gorgeous and the nut filling sounds perfect for winter! Thanks! There are lots of differences, also between east and west and so on. A lot to learn even for me. I think it would be hard to steam dumplings in milk because it has such a tendency to boil over. I like the idea of steaming over water much better. I love the texture of steamed buns, and the ones you made look and sound delicious. Ja, das kann sein! Muss ich auch mal unbedingt probieren. Ich liebe Mohn. You are right and I thought the same thing. But there must be a trick to it because it is a quite commom technique. I hope I can figure it out.